Gill works with abstract conceptual forms that are hugely influenced by the sea as well as nature in all it's forms. She interprets the rough and smooth textures of rock pools, riverbeds and the movement of water which is of constant fascination to her. Gill's sculptural pieces represent a suggestion of a captured movement, a flowing form stretching or curling. She works with pewter in it's molten state that is worked quickly then it is further worked extensively once cool to achieve it's final appearance. Her more sculptural pieces are made using pewter sheet, silver or copper to capture the movement of water which is achieved using traditional silversmithing tools and techniques as well as the relatively new technique known as fold-forming. Gill trained with silversmith Owen Madhloppe-Philips at adult education for five years. Four pieces of jewellery were hired by BBC drama New Tricks and worn by Anna Calder-Marshall in the episode “Objects of Desire” - she makes only to commission. Gill also makes small silverware, her stamp for precious metals is with the London Assay office for hallmarking. 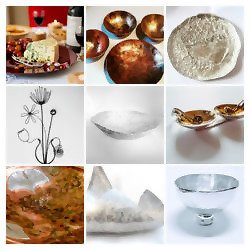 Over the years Gill has also enjoyed the wonderful design possibilities of pewter encouraged by The Worshipful Company of Pewterers at Pewter Live 2014 winning the award for Design and Collectability. Gill makes sculptural and domestic pieces for the home. Gill is also a member of The Association of Pewter Craftsmen and her work has the seahorse and ABPC stamp on her high-end pieces. Modern pewter is an alloy of tin, antimony and copper, and no longer contains lead at all. Contemporary pewter conforms to BS and EU standards.